Hi to all… 2011 is now ending with this fine album from the legendary Irish Folk singer/songwriter Christy Moore. Produced by Declan Sinnott, Folk Tale is the latest result of Christy and Declan’s unique musical alliance. Christy Moore has a universal fan base and still continues to entertain, cementing him as an Irish icon and helped to create and develop a faithful following that quite frankly alludes most other artists. It’s quite possible that there couldn’t be a more fitting title for this album, and not just because it’s the title of one of the songs contained therein. Christy can legitimately lay claim to being the epitome of the living, breathing folk ‘process’; indeed, one of the most rewarding aspects of following his career is the way in which his material morphs and reinvents to suit the occasion, be it the musicians he’s playing with, the audience to which he is playing on any given night, or the more substantial reordering that arises from the growing wisdom and perception that is amassed as the years pass by. 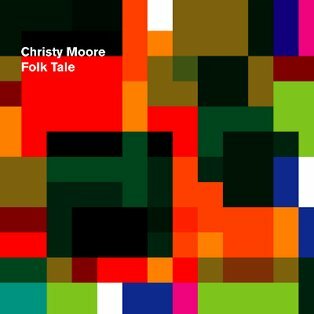 It’s this very aspect that distinguishes Folk Tale as something that little bit more special: it’s a snapshot of where Christy is right now, the continued story of the songs he’s carried along with him, alongside the new chapters that reinvigorate and fortify his voyage. Two particular highlights find Christy furnishing songs of tragedy with a genuine compassion, whilst avoiding any hint of mawkish sentimentality. Kevin Littlewood’s “On Morecambe Bay” thoughtfully observes the fate of illegal immigrant cockle pickers, lost to the deadly tides. The narrative is remarkably evocative for placing the workers firmly amongst the local community, with the writer seemingly expressing a sense of collective guilt for being aware of their plight, but failing to intervene and warn of the treacherous dangers out on the sands. “Haiti” takes a more global view, with it’s clarion call to a nation to rise up and “smile again” in the wake of the harrowing earthquake that decimated the country. The contemplative manner with which Christy approaches these songs probably gives voice and emotion to many who witnessed these events from afar. Several pieces from Christy’s 1996 album, Graffiti Tongue, receive a more circumspect reworking, seemingly holding at bay some of the anger that permeated the original recordings in favour of more considered readings that are no less disarming. In particular “God Woman” basks in a genuine feeling of warmth, whilst the title track benefits from a more reserved, melodic approach that somehow makes the romance of the story much more compelling. Folk Tale also reminds us of Christy’s keen sense of humour. “My Little Honda 50” is a light-hearted ditty, on the face of it a quirky tribute to a an even quirkier form of transport, yet dig beneath the skin and it’s a fond recollection of simple times and simpler pleasures. “Weekend In Amsterdam” is a more raucous affair, with some lyrics that I daren’t even repeat within these pages! Harking back to his days with Planxty, “Farmer Michael Hayes” is recast in a more sparse arrangement, delivered at a slightly more measured pace, proving more reflective than the hearty rebelliousness of the original Planxty recording, largely owing to the greater depth and maturity that age has bestowed on Christy’s voice. Drawing together the disparate threads of artistry that inspire and nourish his life, Folk Tale draws from a rich palette taking in poetry, politics, humour and tragedy. It’s a collection that is no doubt richer for the accomplished production skills and sympathetic musicianship of the doggedly talented Declan Sinnott, but it’s most certainly Christy’s heart that beats strong throughout.